Why is it some of us dislike the changing colors of fall? Do you sense it's more to do with summer withdrawal than fear of winter storms? For those of us truly attached to the outdoors, fall inevitably deems itself a ‘mixed emotion’ season despite the substitute activities of apple picking, leaf peeping, pumpkins and cider donuts. Ask yourself what it is you truly miss about summer. 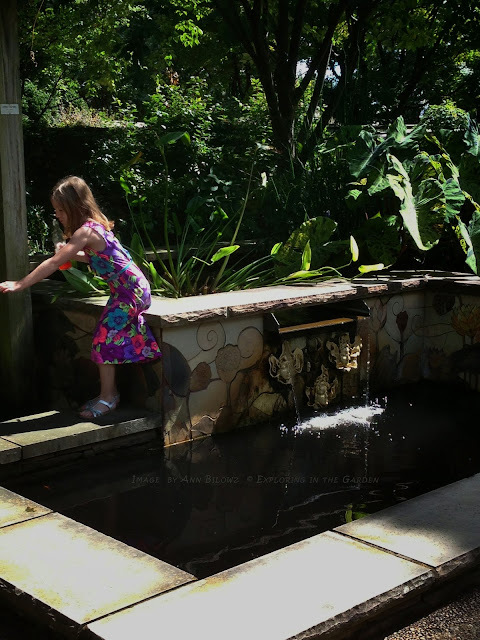 For me, just like the young girl in this image I captured at the +Atlanta Botanical Garden, it’s simply being able to discover the garden. So what’s the best way to engage for an all year-round garden experience? Getting a family membership to a nearby botanical garden certainly helps and one we definitely promote. But here's one the design industry needs to bring to the forefront. Landscape architecture is more than designing for simple observation and beauty. Engaging design is meant to be discovered, explored, and best, to be engaged with. If you've made it this far, here’s the Thursday challenge - engage your children in the garden for one main reason. It pays off in dividends later down the road. For those in need of formulas, here's the basic math equation. Just the other day, a client mentioned wanting to plant bulbs with her son. These are words we love to hear most… that there’s youthful engagement and discovery in the garden including bulb plantings that shall blossom when the snow melts. While this may only be applicable to those of us living in these less than friendly climates, this is one of those subconscious lessons that remains forever implanted. Engage now as a child in the garden and it inevitably wears off on you later down the road. Introducing gardens at a young age increases a child’s awareness of the great outdoors. And there’s nothing more invigorating than discovering a summer garden, someone else’s or your own. Teaching children that you can plant in the fall what will blossom in the spring is bigger than a lesson on horticulture or beauty. It’s about hopefulness, which as adults we need in big doses, especially during the changing colors of fall that lead to winter and an elongated quietness in nature. As L. Frank Baum pointed out about imagination and children discovering what is around them, “The imaginative child will become the imaginative man or woman most apt to create, to invent, and therefore to foster civilization.” As Baum stated best, “Imagination has given us the steam engine, the telephone, the talking-machine and the automobile, for these things had to be dreamed of before they became realities.” While all those inventions may seem passé, engaging our children in the garden pays off later down the road, wherever his or her road shall lead. The Thursday challenge: plant some fall bulbs and watch them pop in the spring.